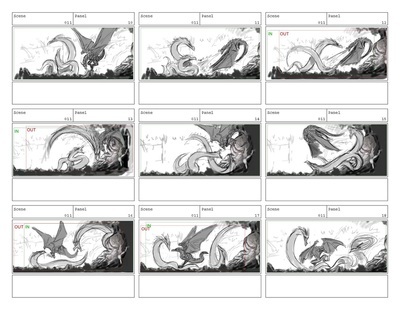 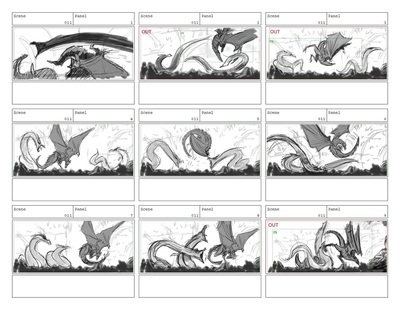 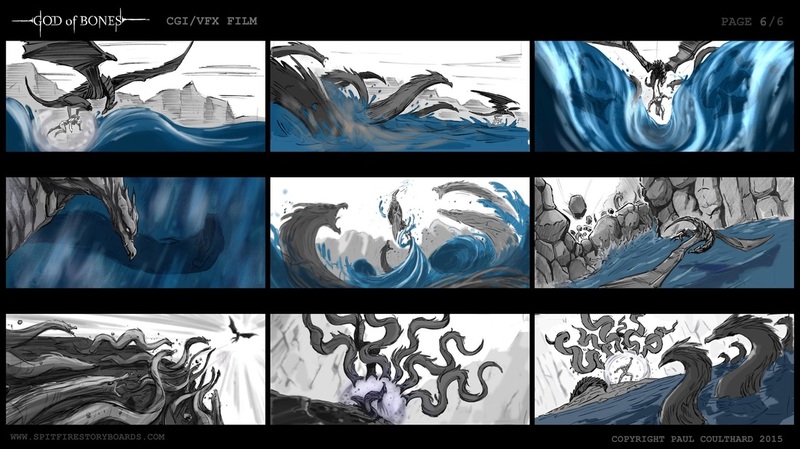 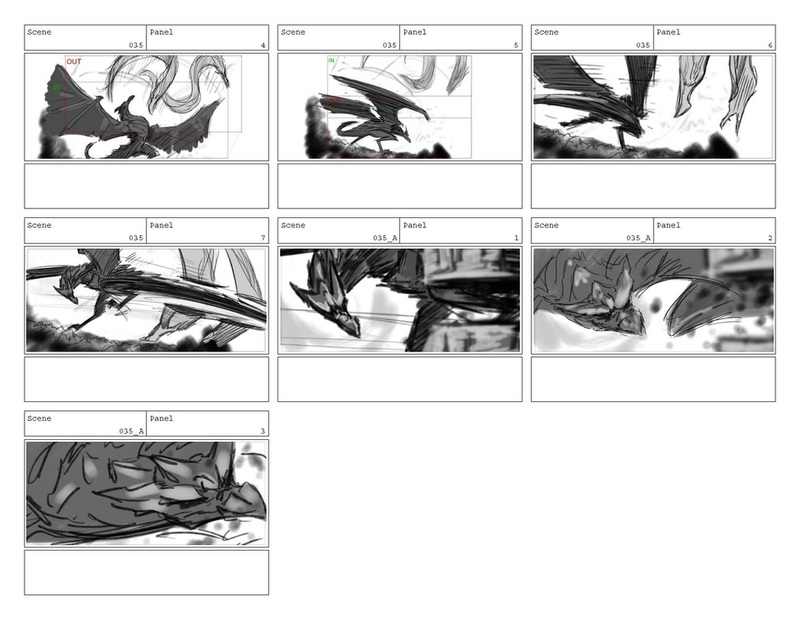 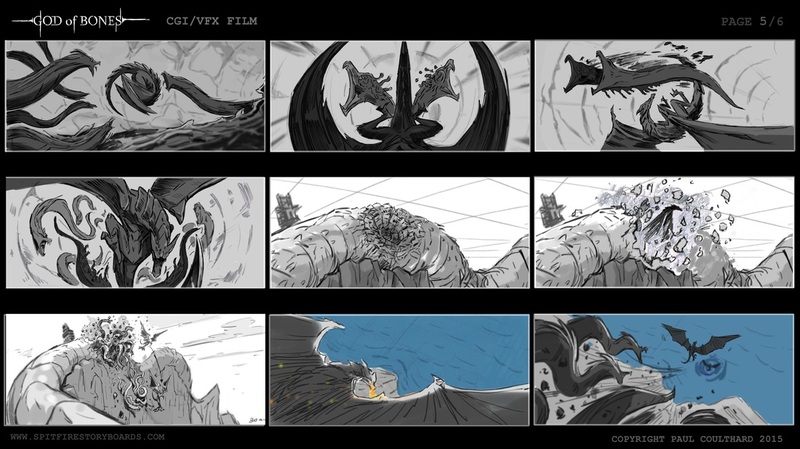 The boards directly below are a selection of finished panels from the storyboard sequences I have developed so far for 'God of Bones'. 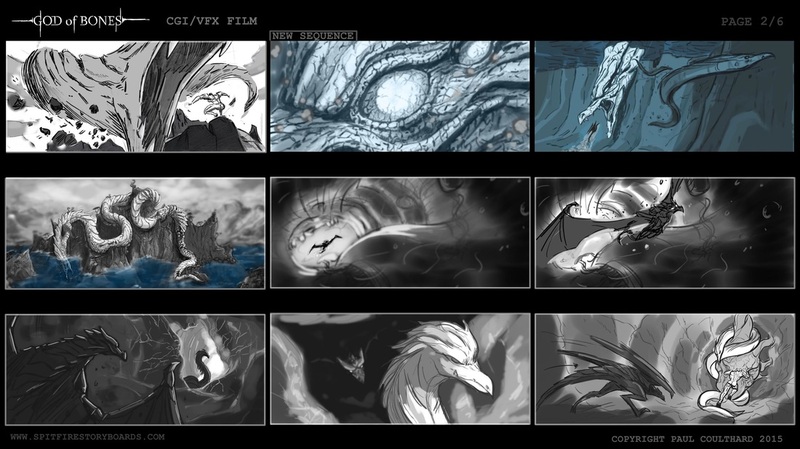 This was compiled as part of my 2015 folio. 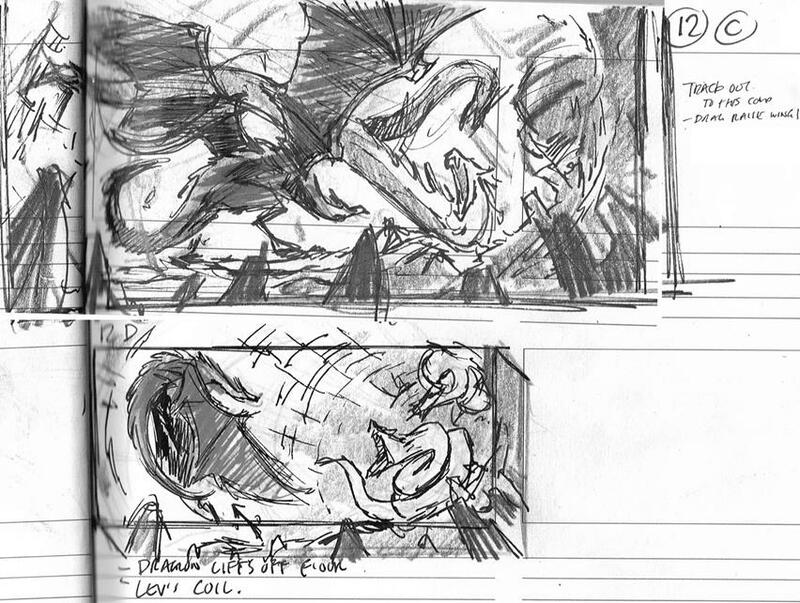 The boards are heavily abridged from the full sequences, the images chosen for maximum impact , composition and interest. 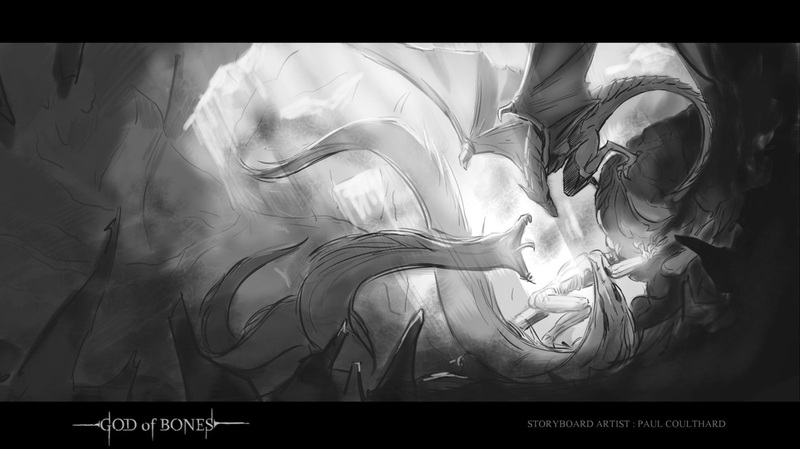 For more information on the concept and story, please read on after the boards. 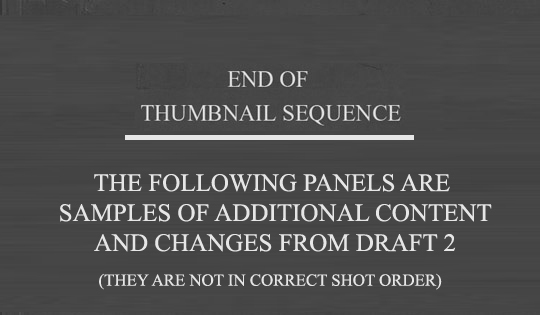 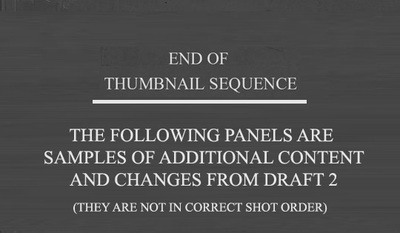 A single-panel slideshow version is displayed after the multi-panel pages. 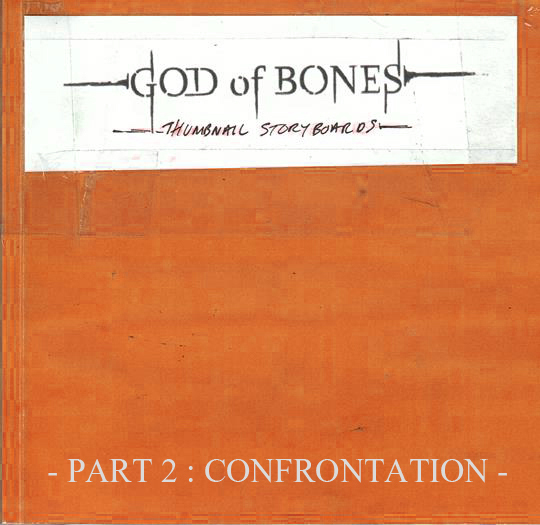 'God of Bones' is a project I am currently chipping away at, as and when I can. 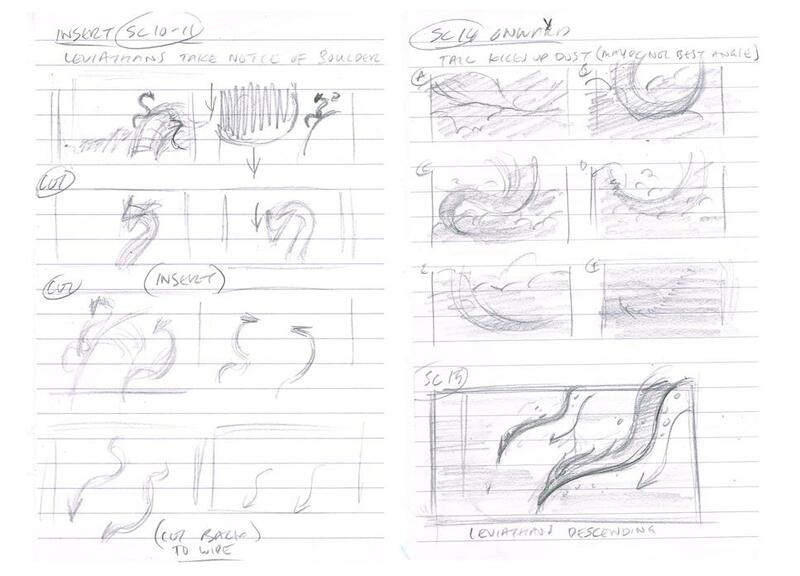 It's a concept that my nephew Harry proposed to me, which then became an ongoing co-creation development through excited conversations, bouncing ideas around. 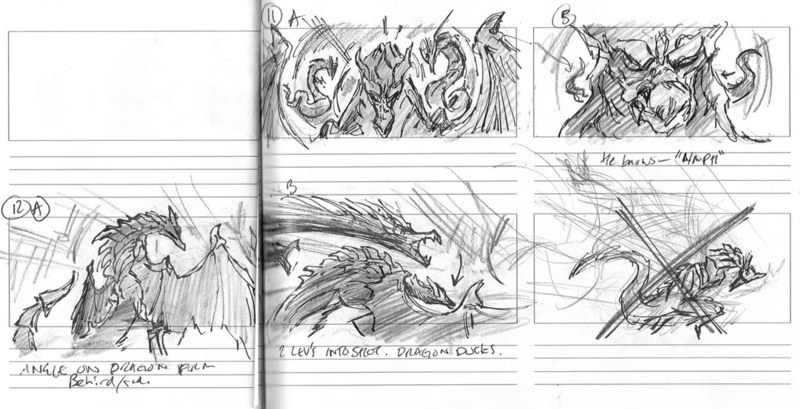 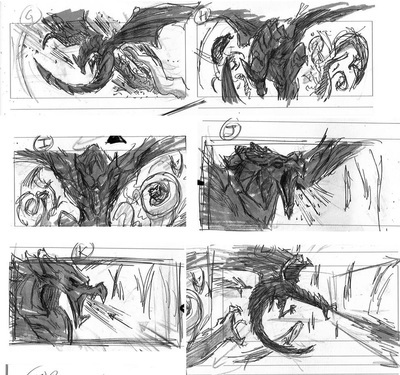 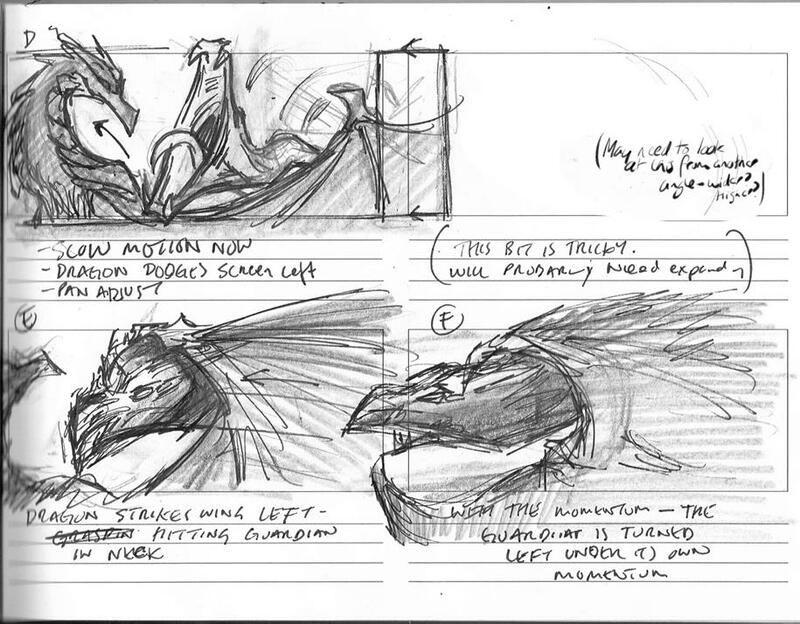 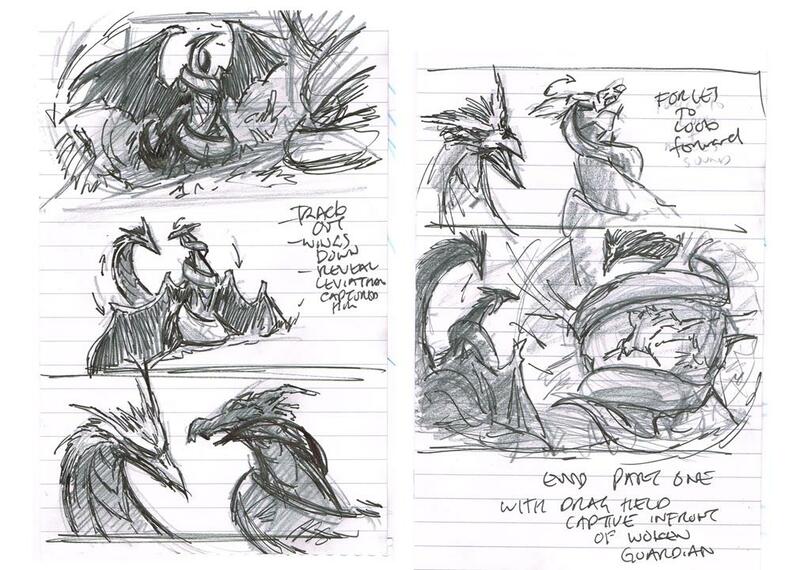 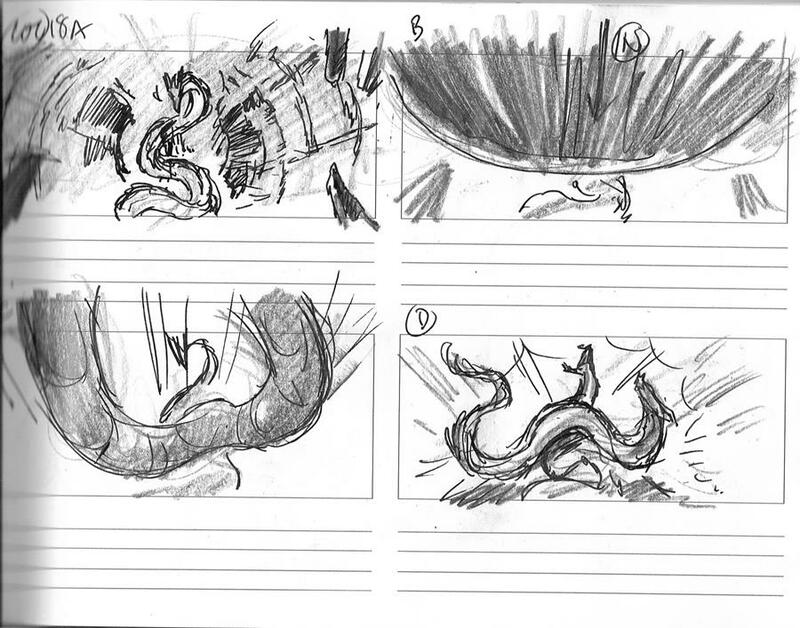 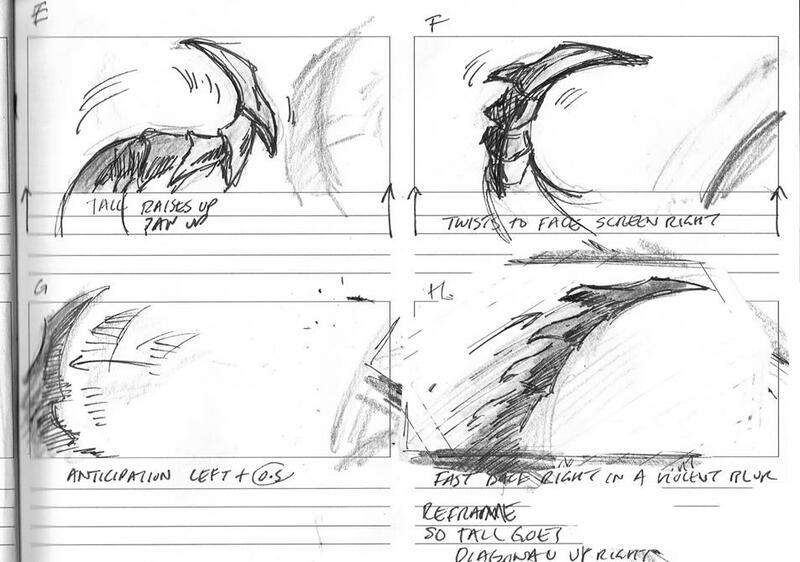 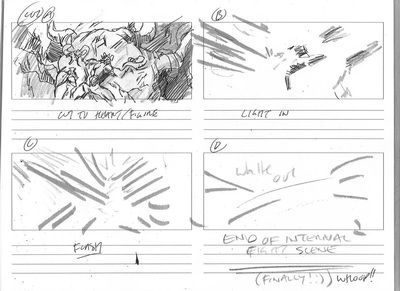 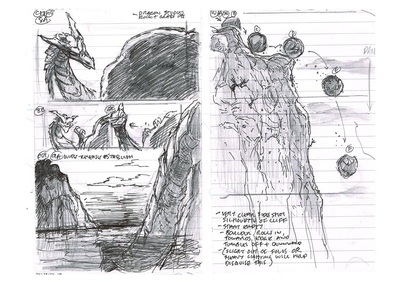 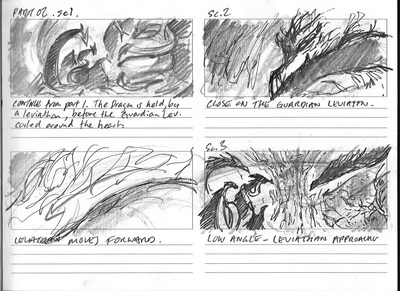 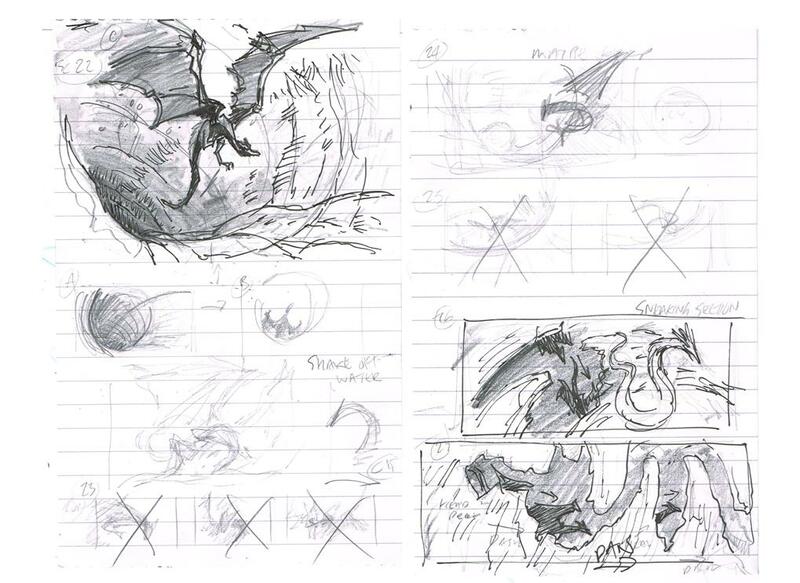 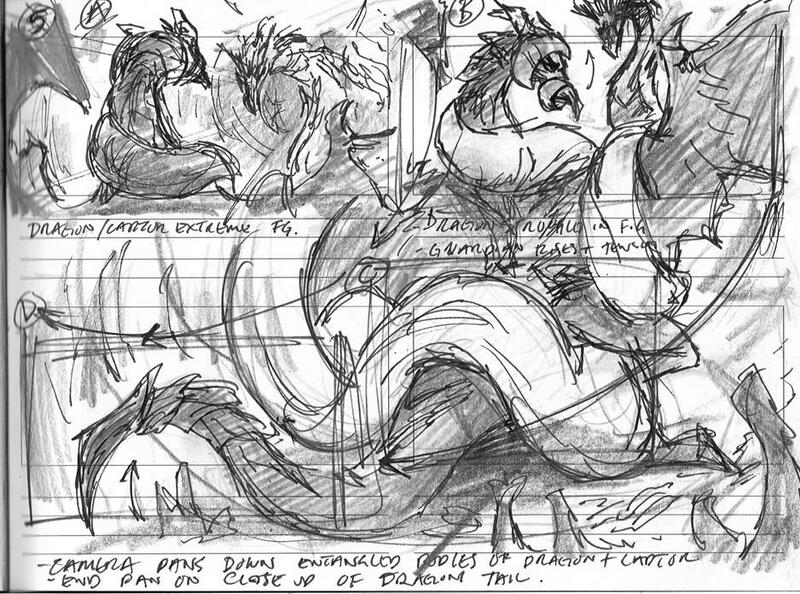 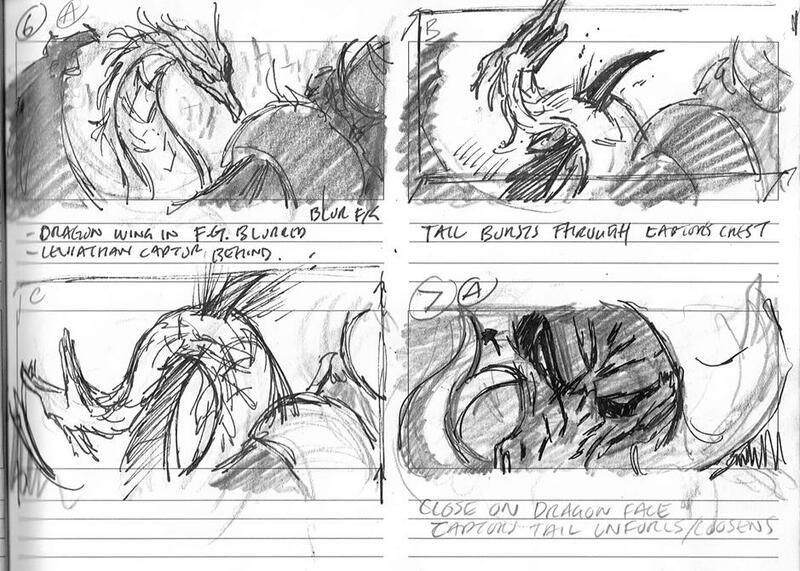 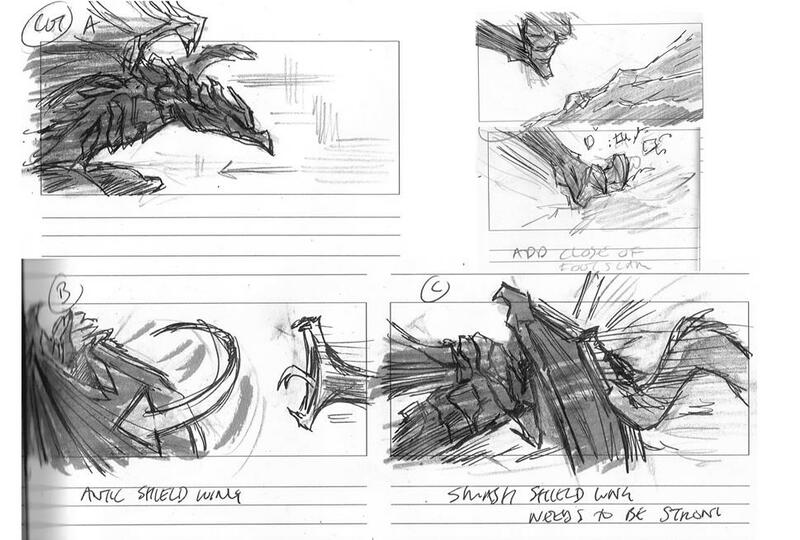 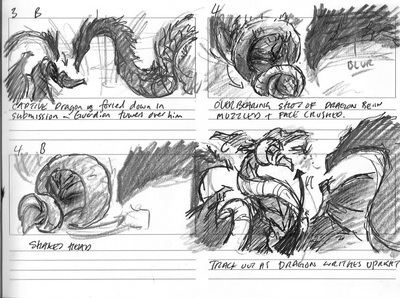 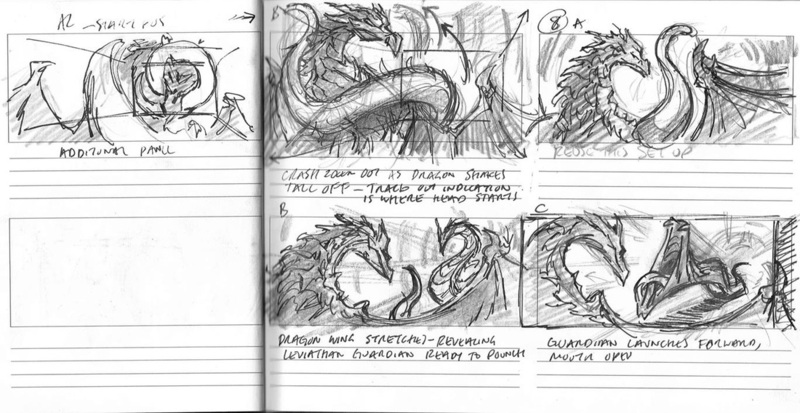 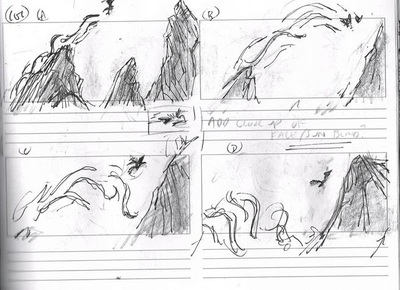 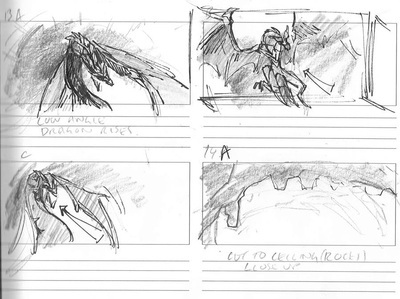 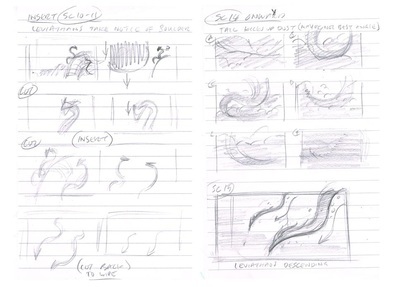 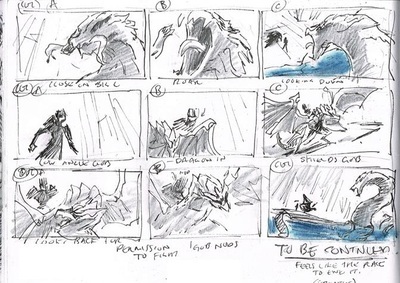 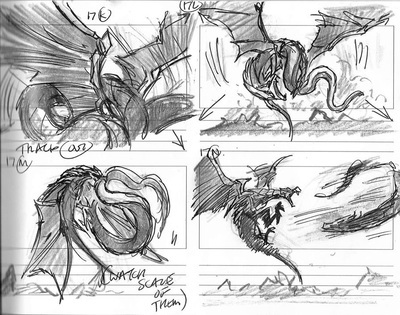 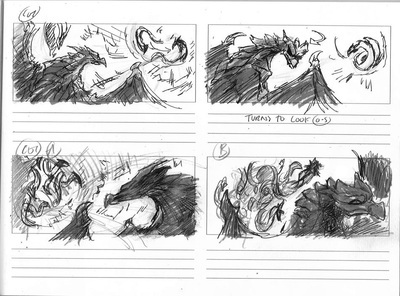 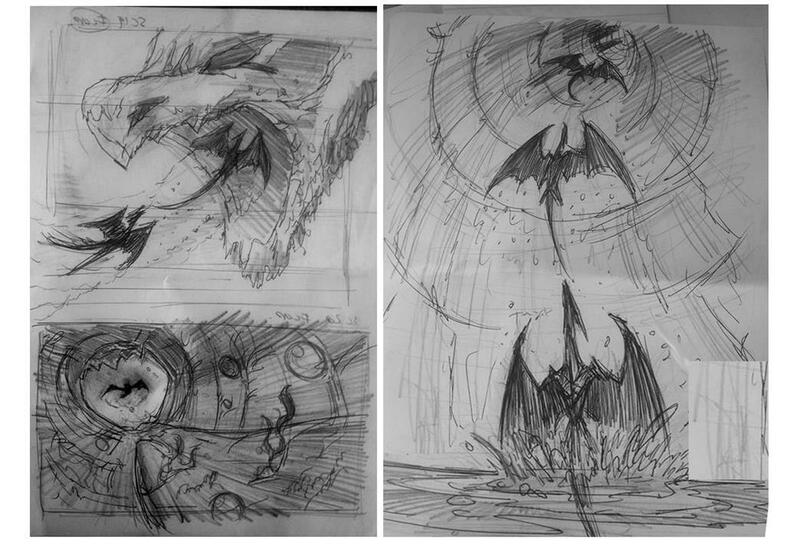 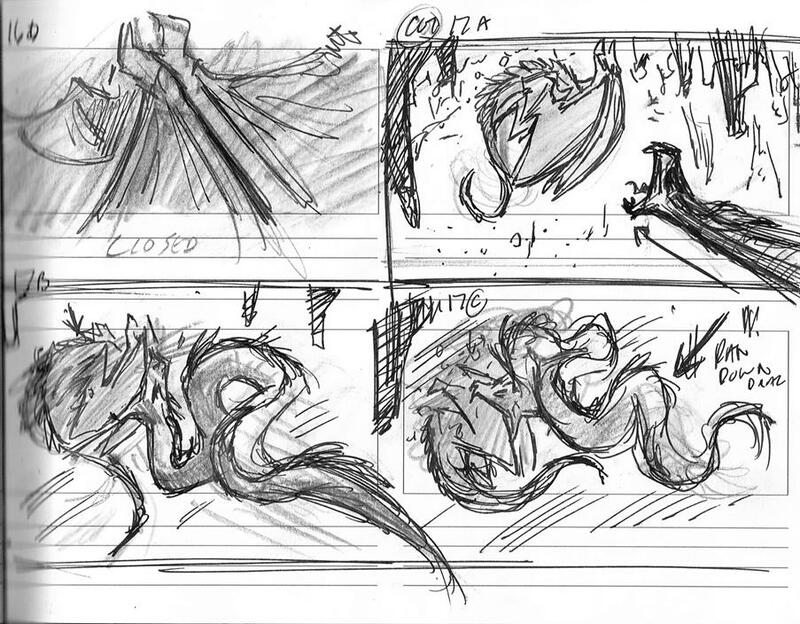 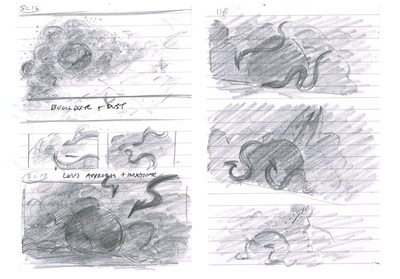 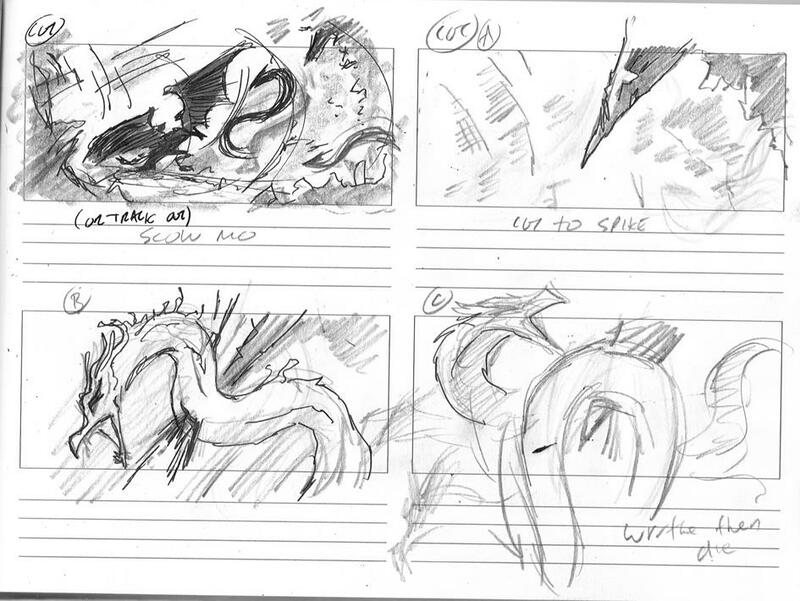 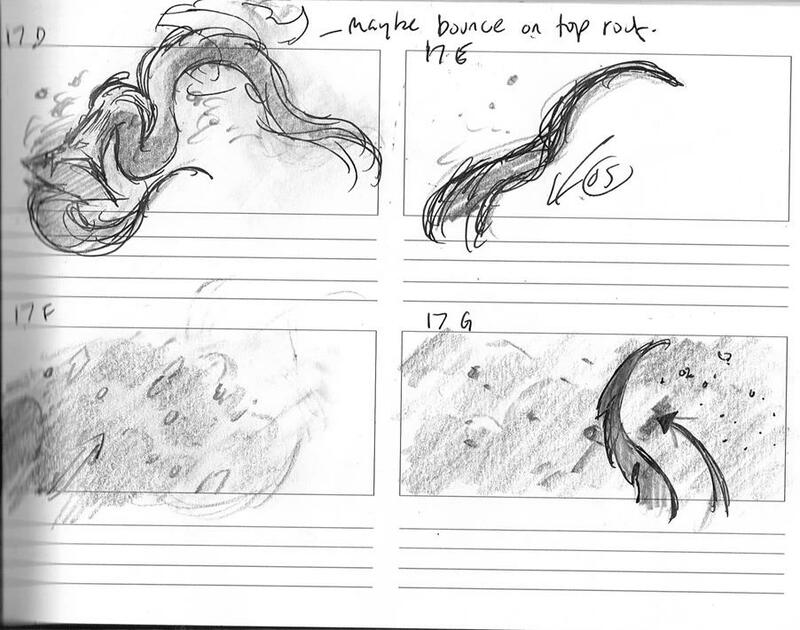 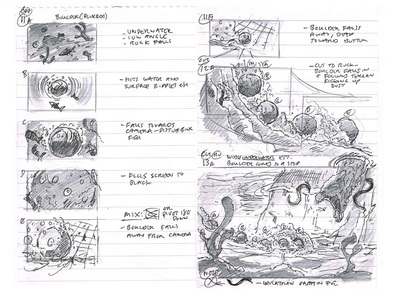 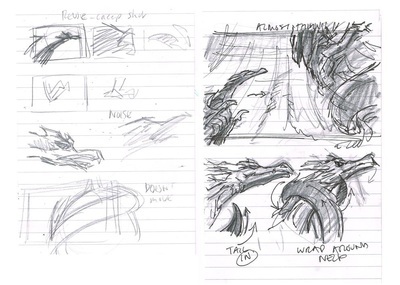 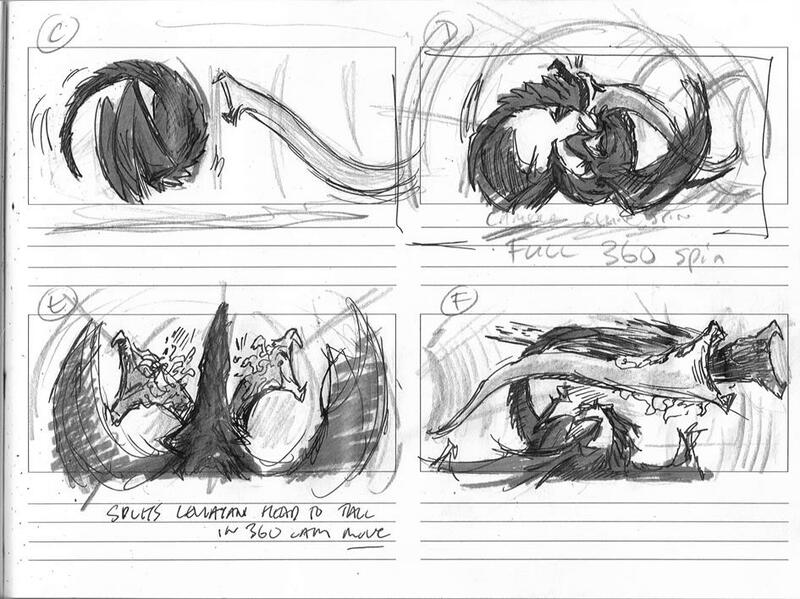 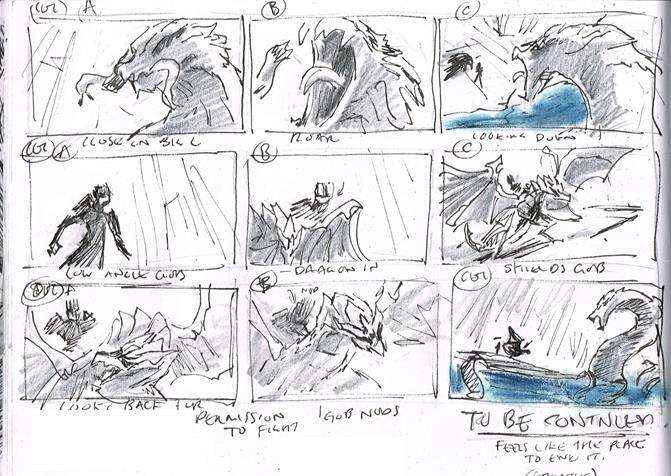 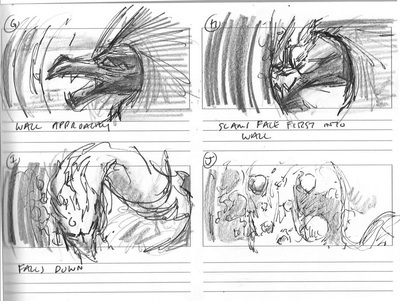 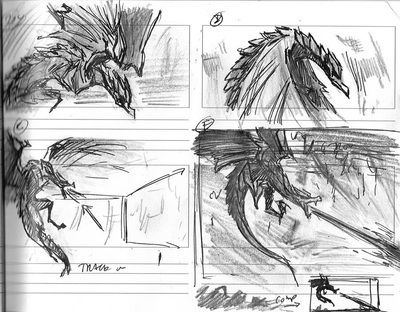 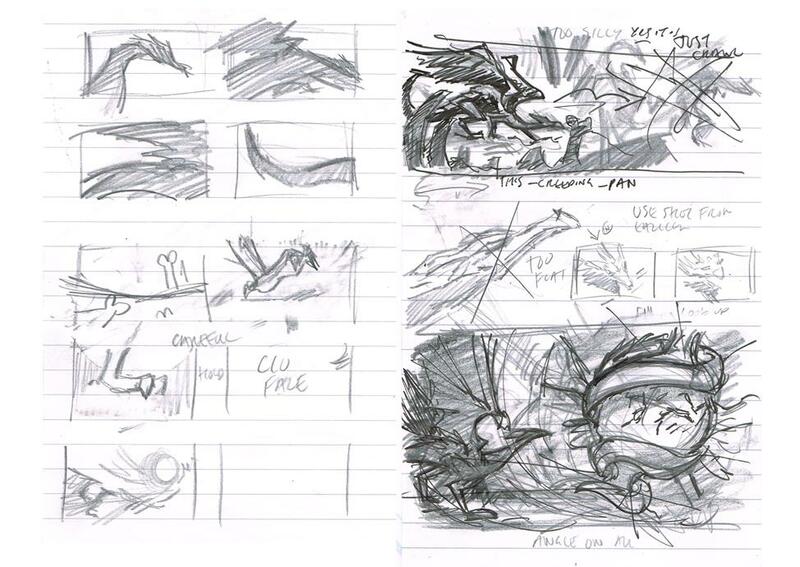 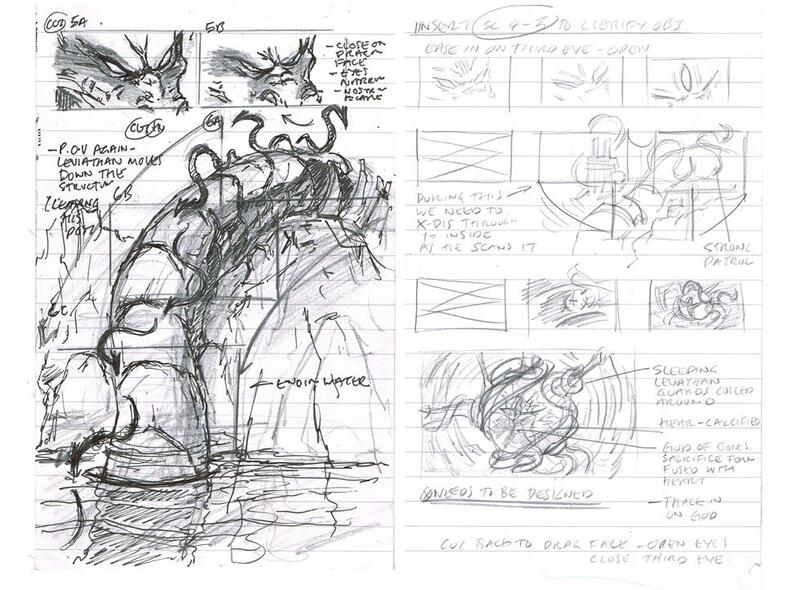 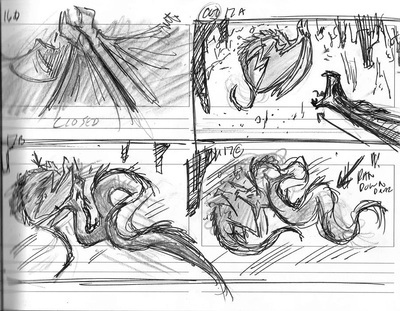 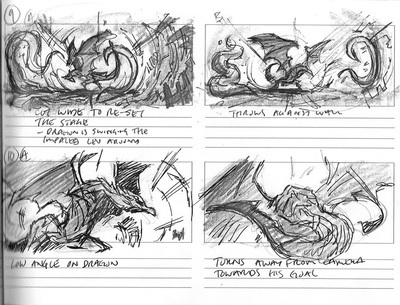 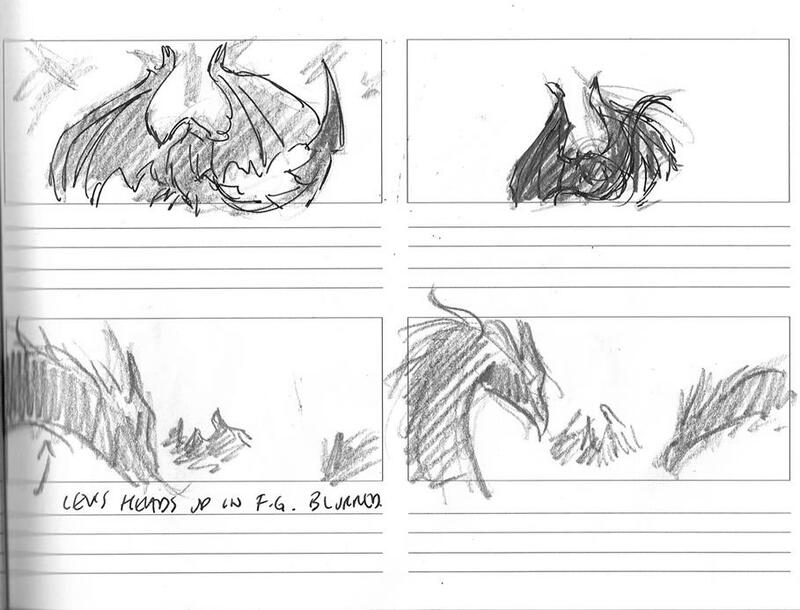 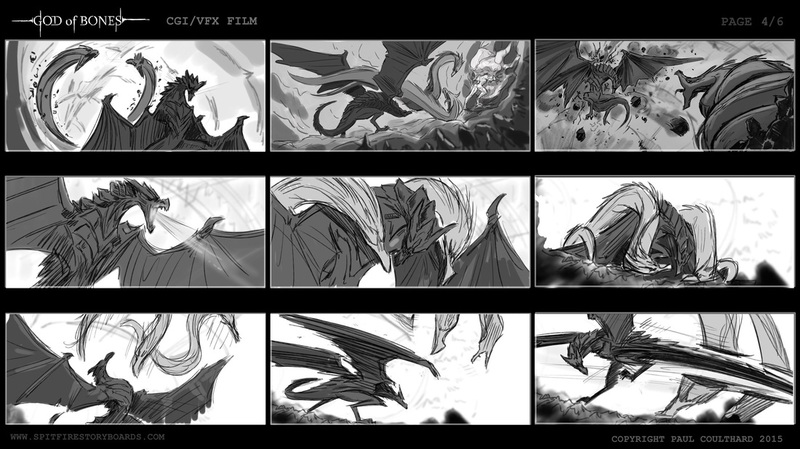 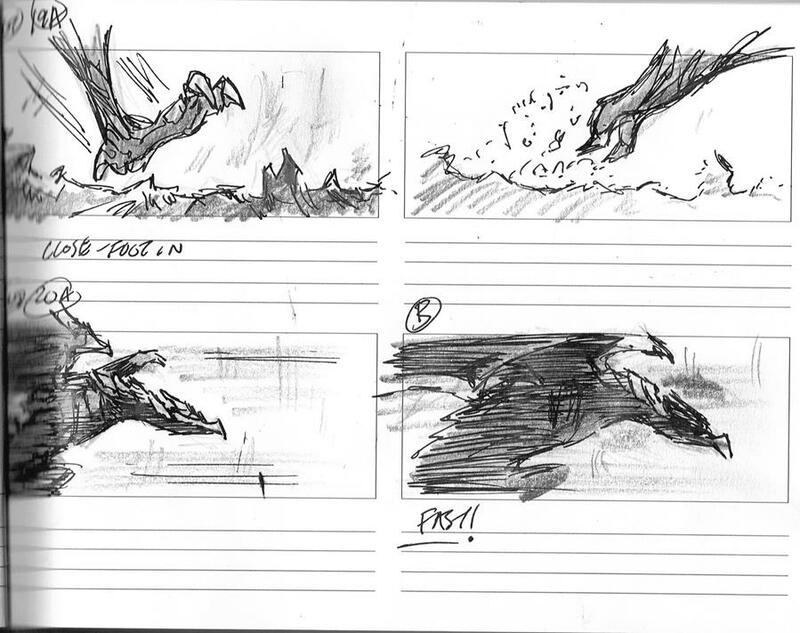 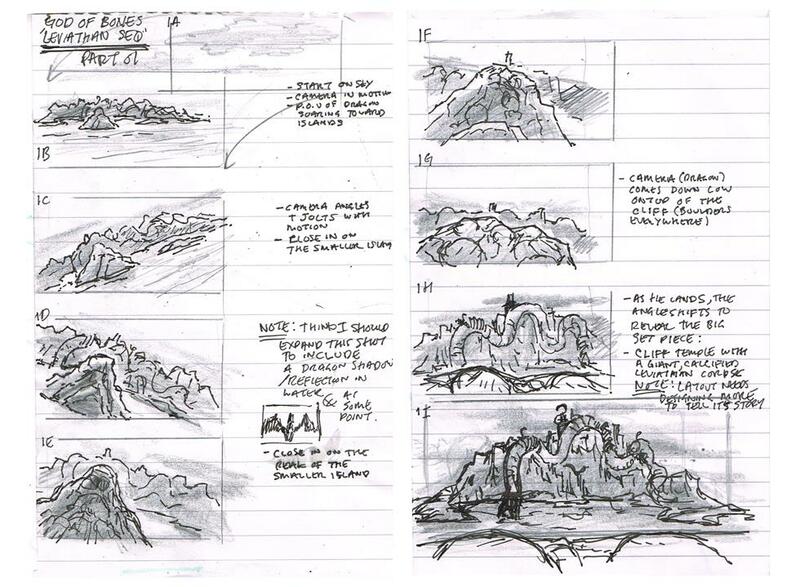 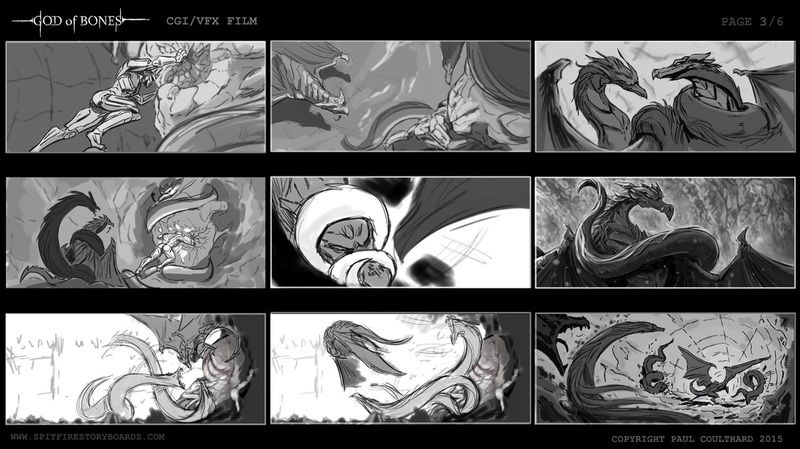 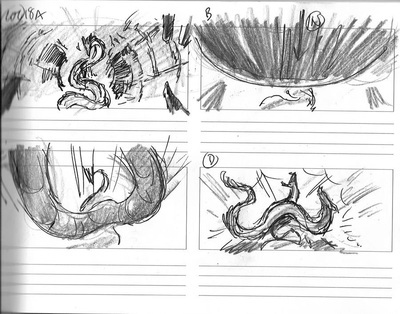 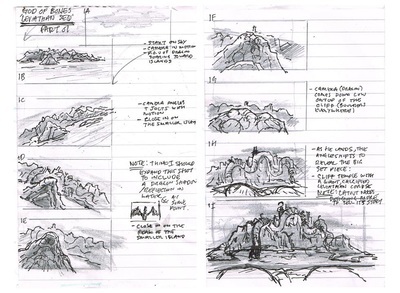 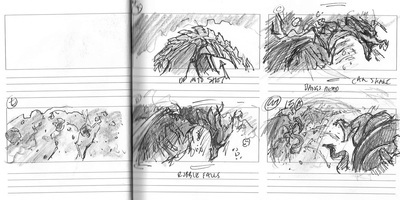 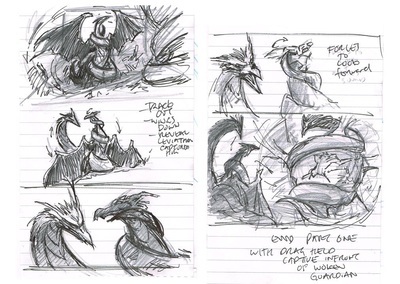 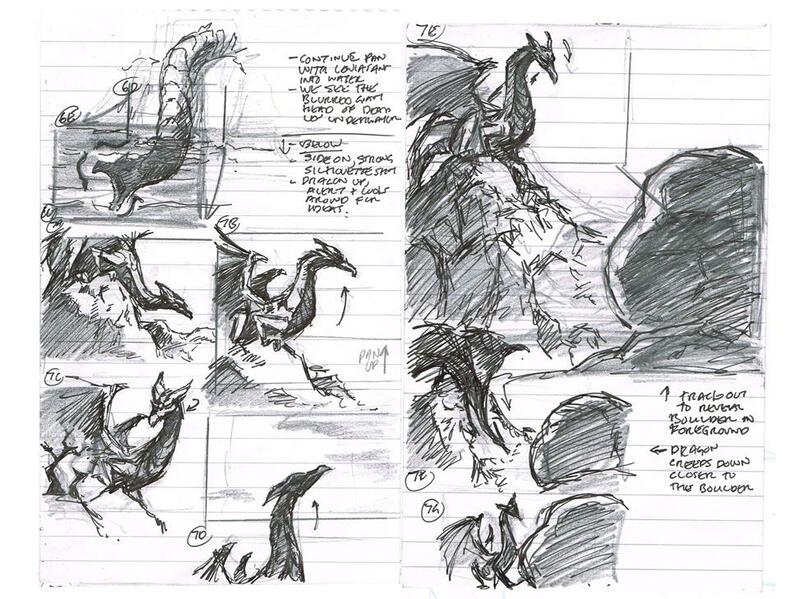 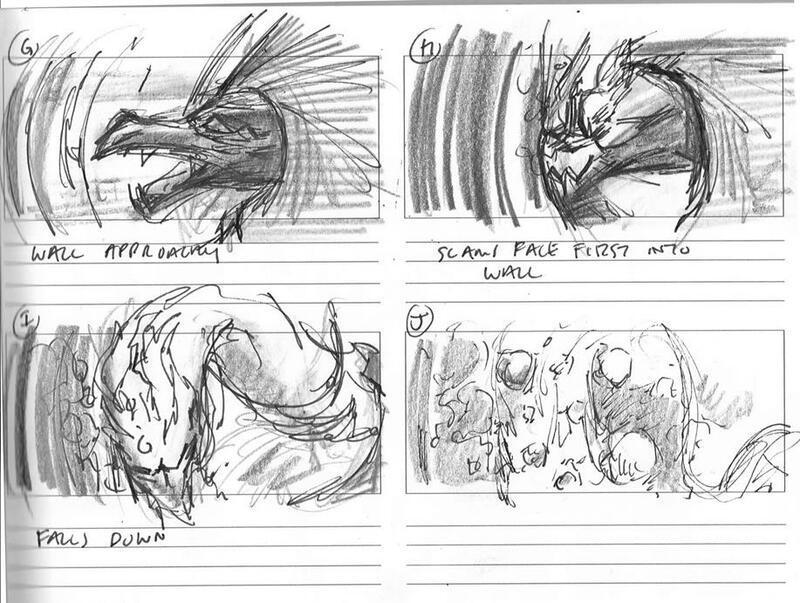 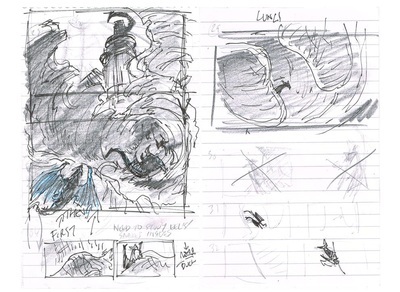 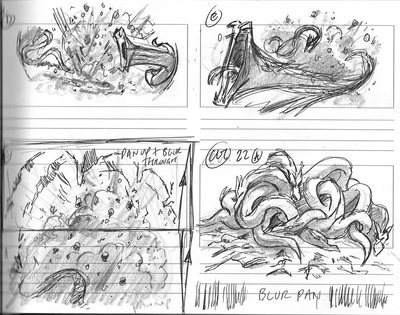 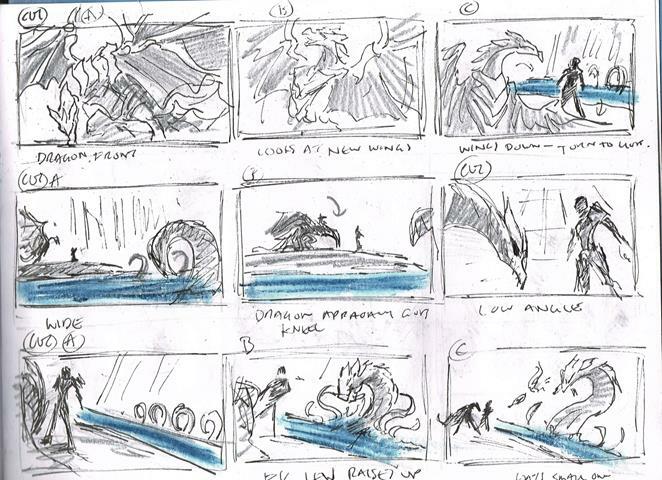 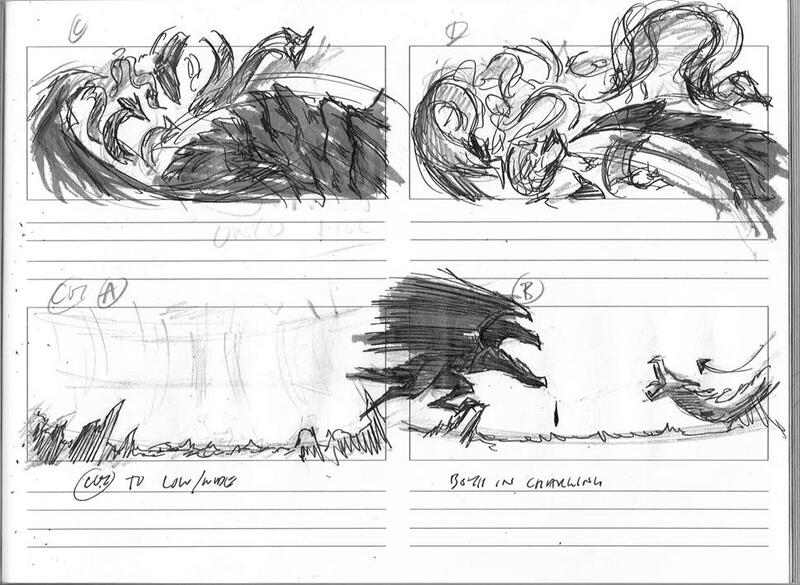 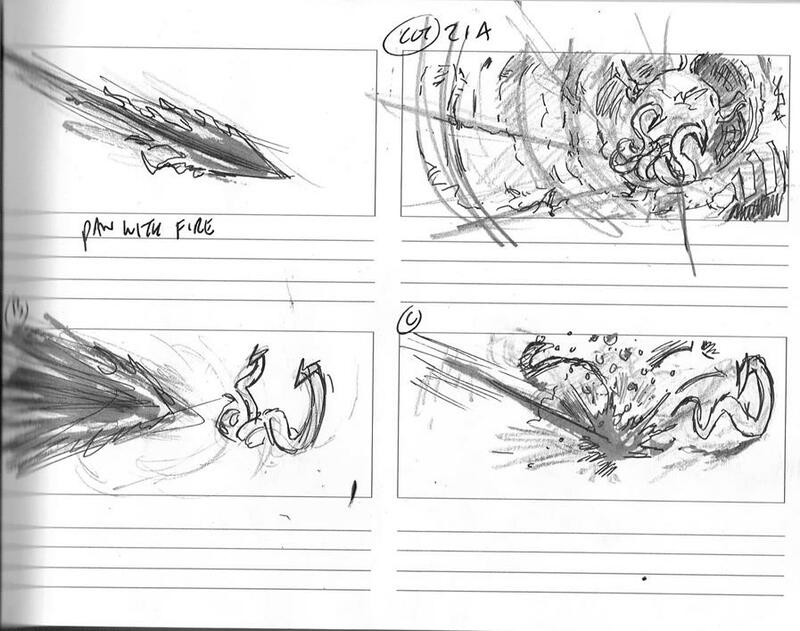 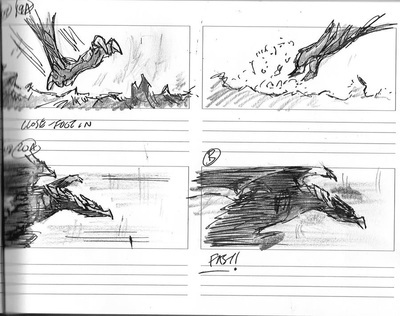 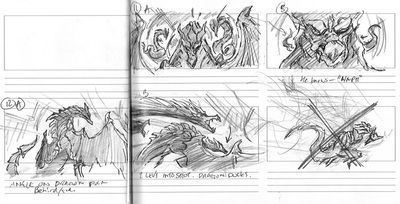 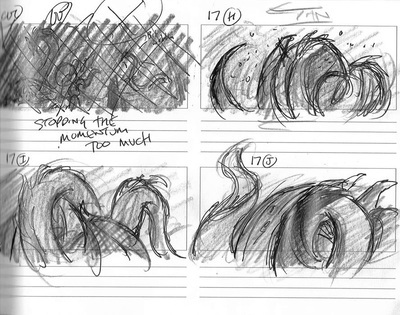 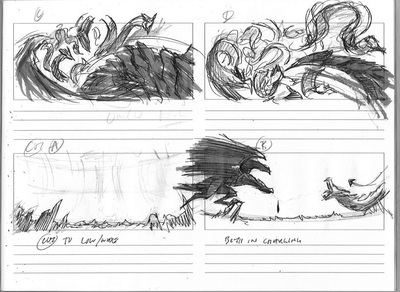 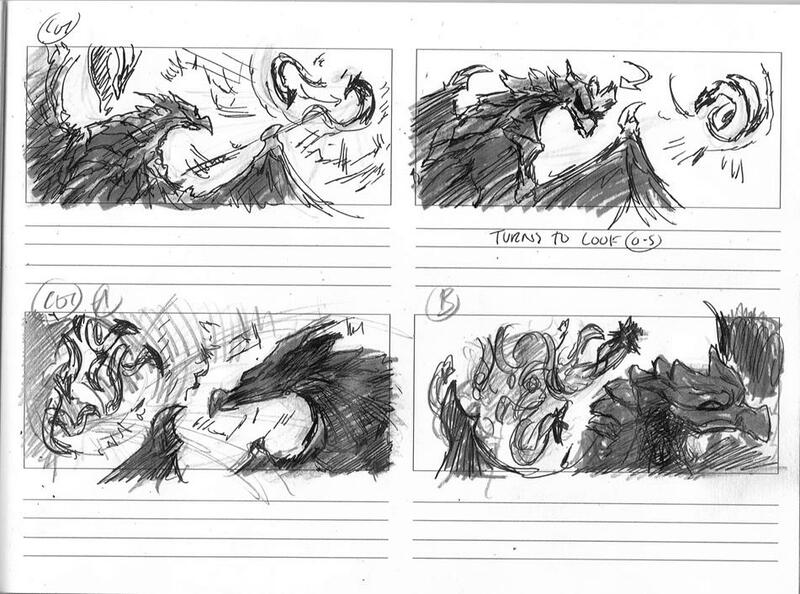 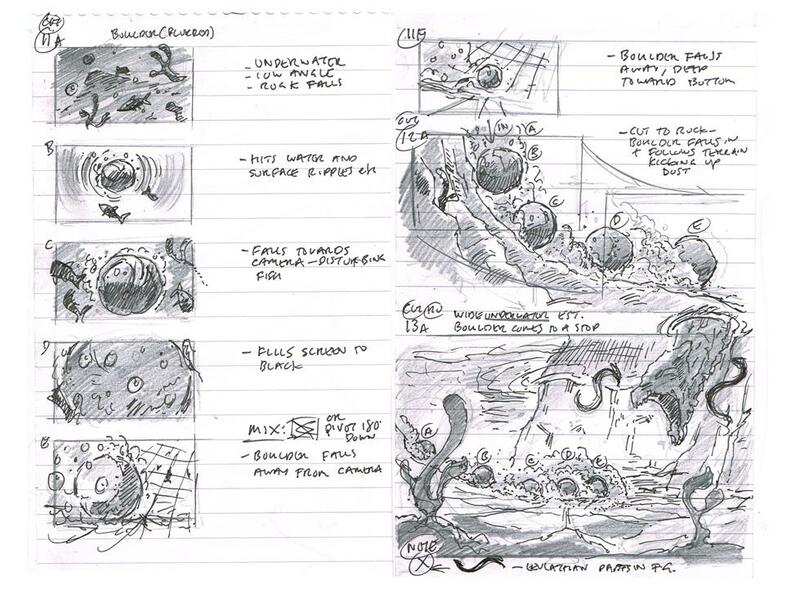 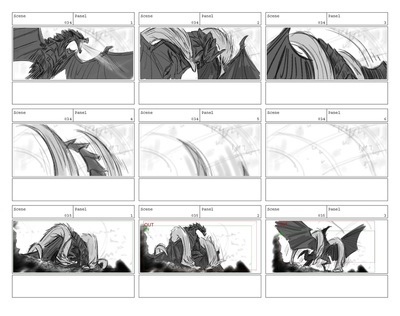 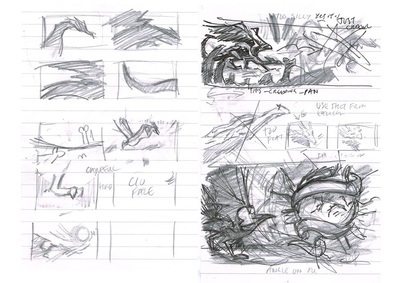 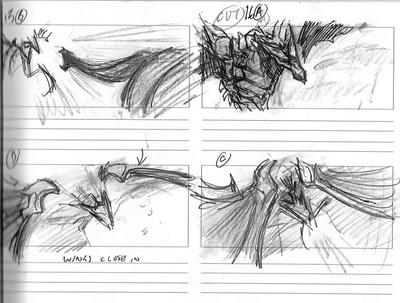 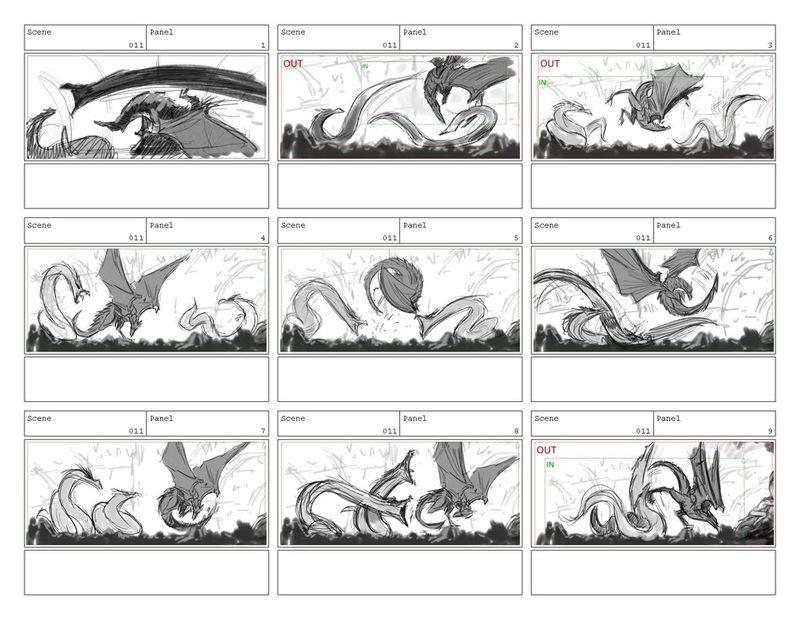 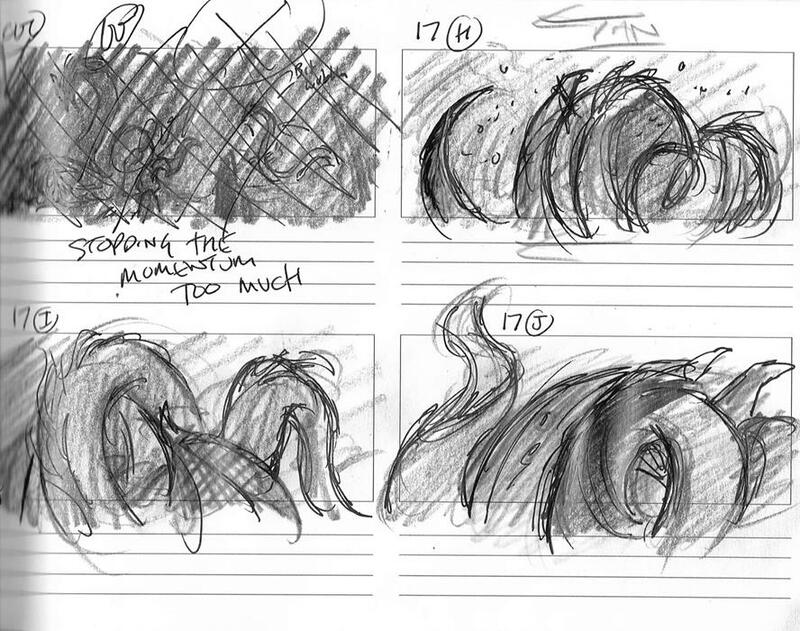 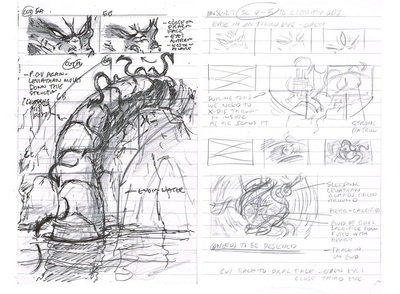 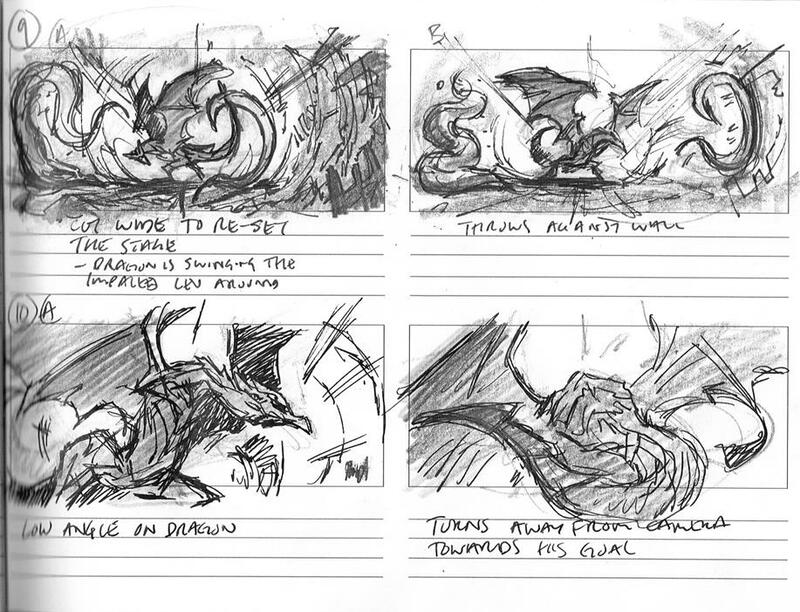 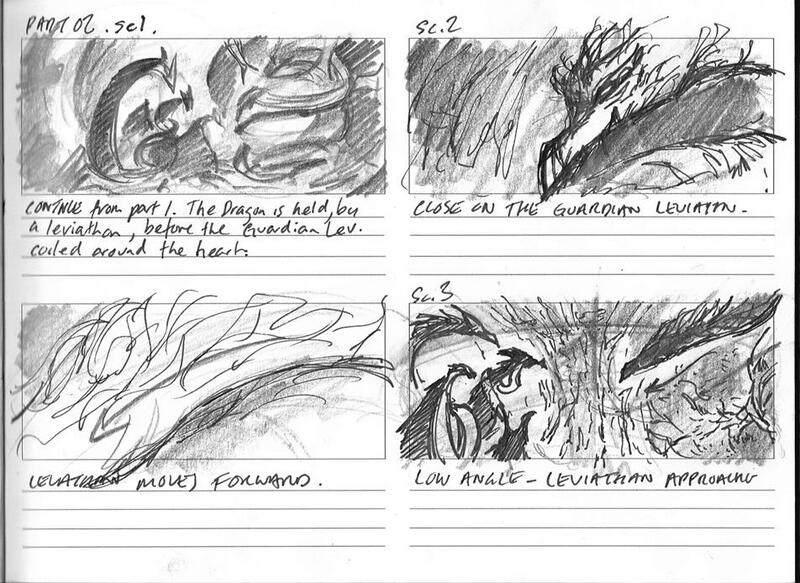 I then started the process of storyboarding a few short sequences to tell the story. The finished storyboard will be an animatic drawn digitally in Storyboard pro (hopefully utilising the 3d camera aspects for some fancy camera moves). 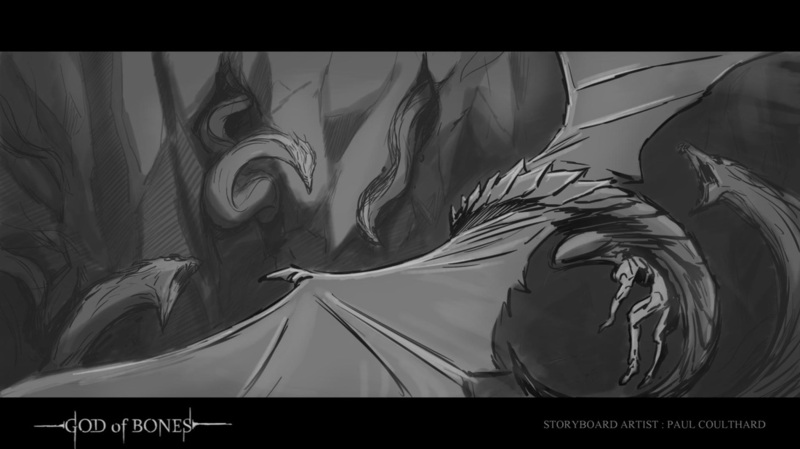 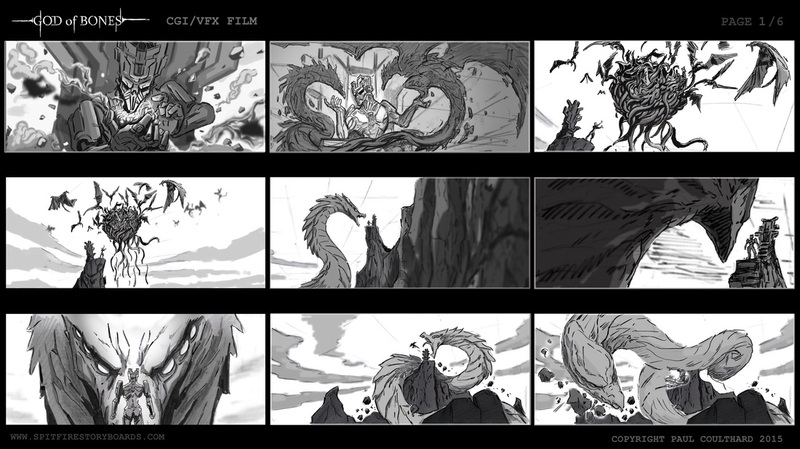 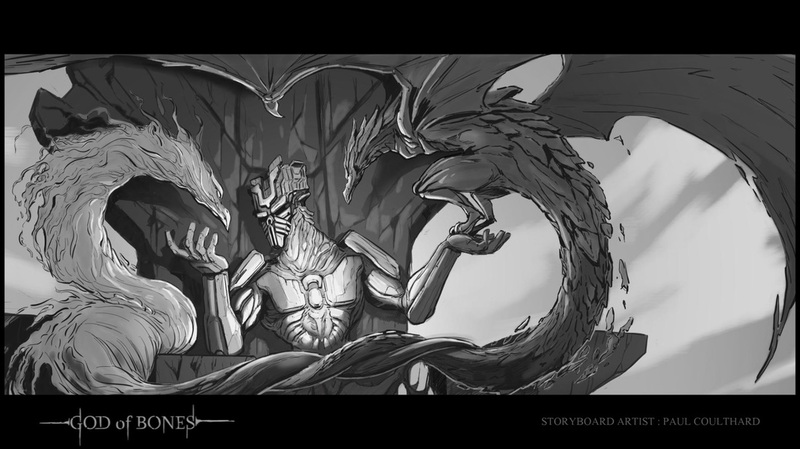 There is quite an elaborate mythology behind the concept, which I hope to visualise at some point, but for the first storyboard I chose to focus on sequences from somewhere in the middle of the story. 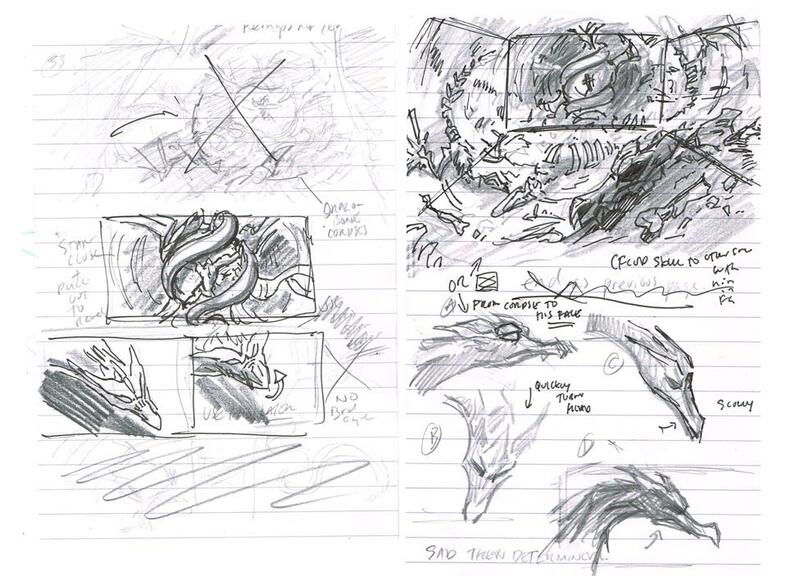 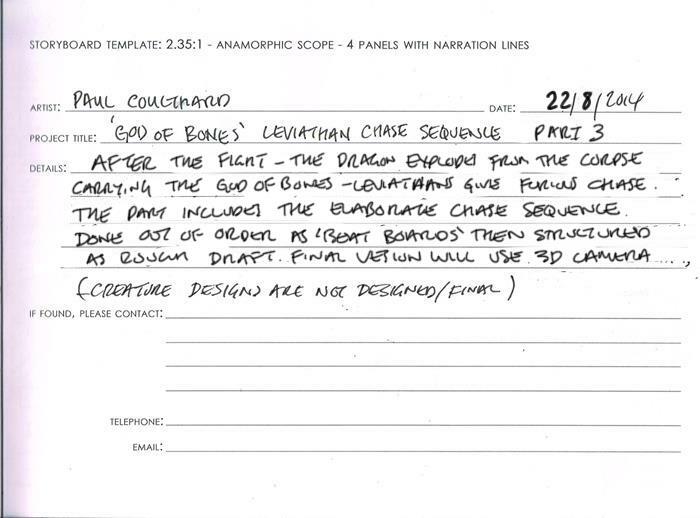 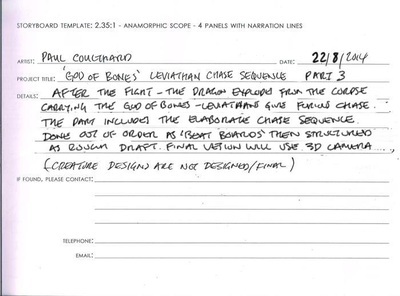 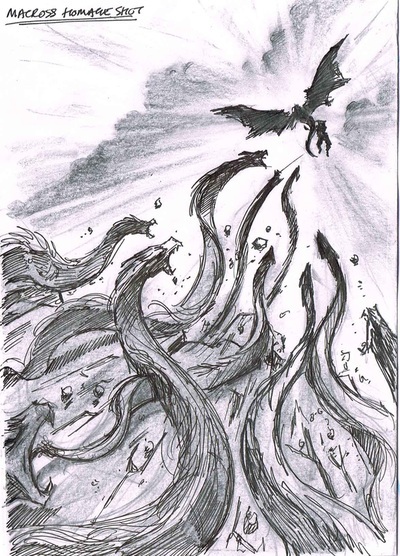 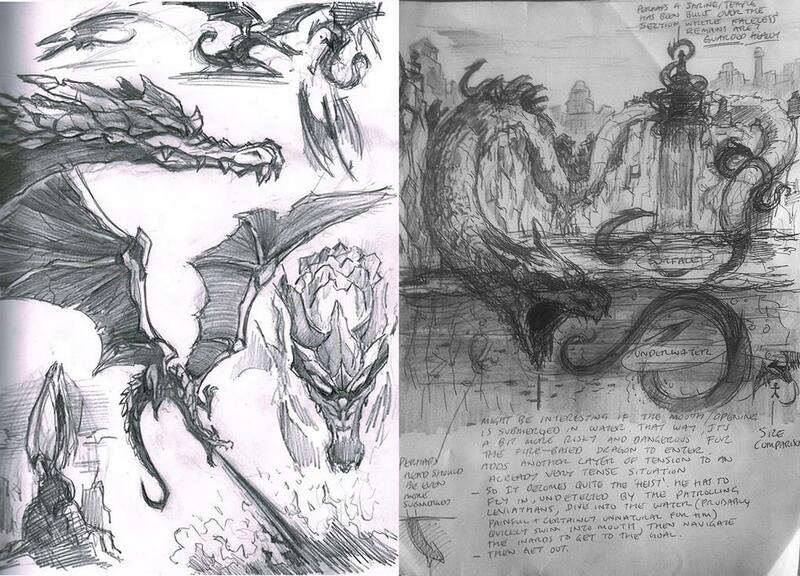 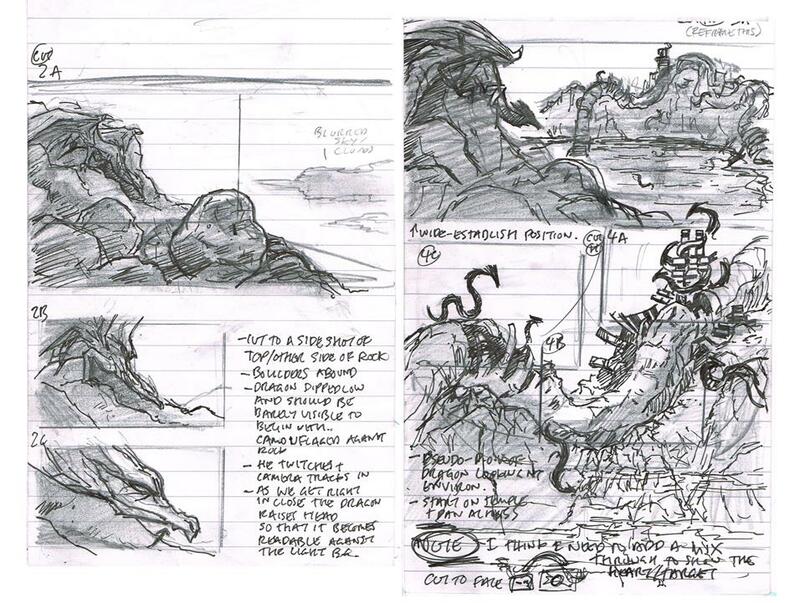 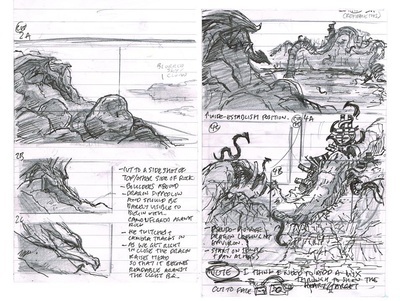 Without going into too much detail, the protagonist, a dragon, ventures to the lair of his enemies, the leviathans. He needs to infiltrate and retrieve something important (the titular 'God of Bones' himself) from deep within the giant, calcified corpse of a god-size leviathan. 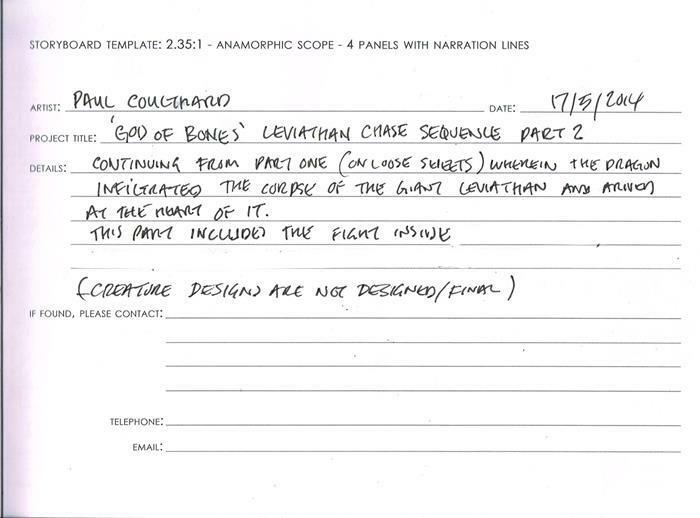 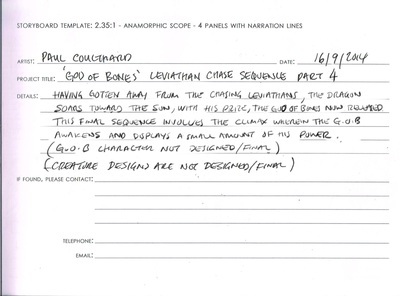 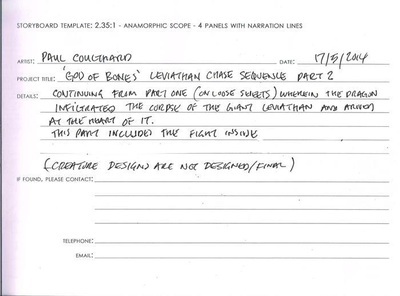 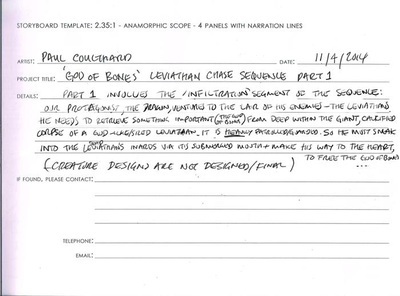 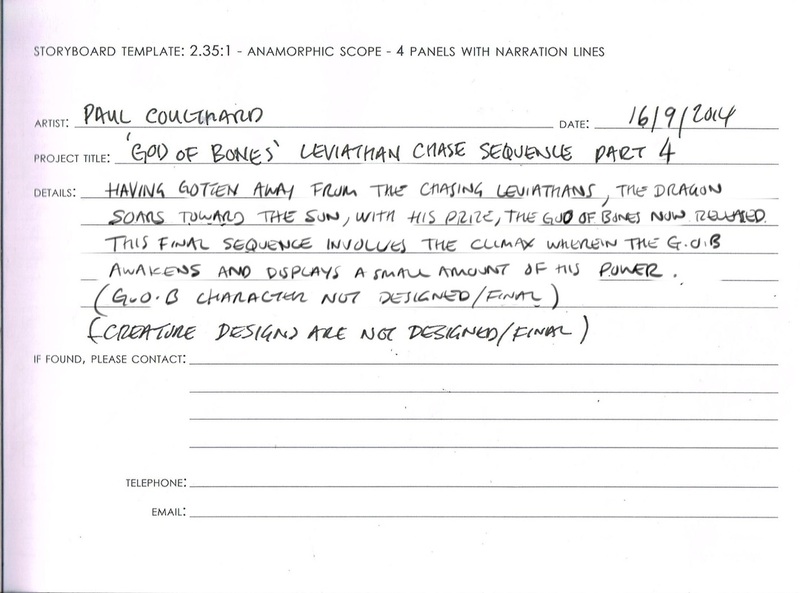 But the 'God of Bones' is fused (though his own doing) with the giant leviathan's calcified heart. 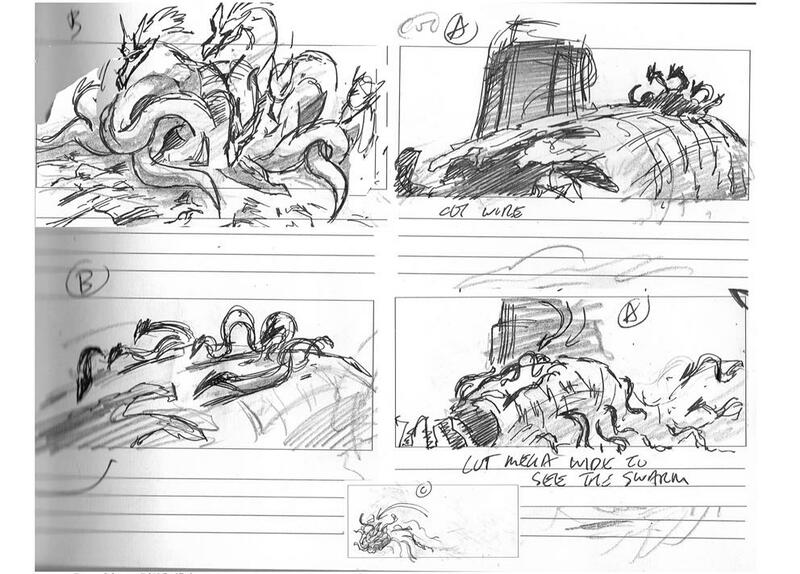 The corpse is also guarded by many living leviathans, so he must sneak in as best he can, avoiding conflict if possible. 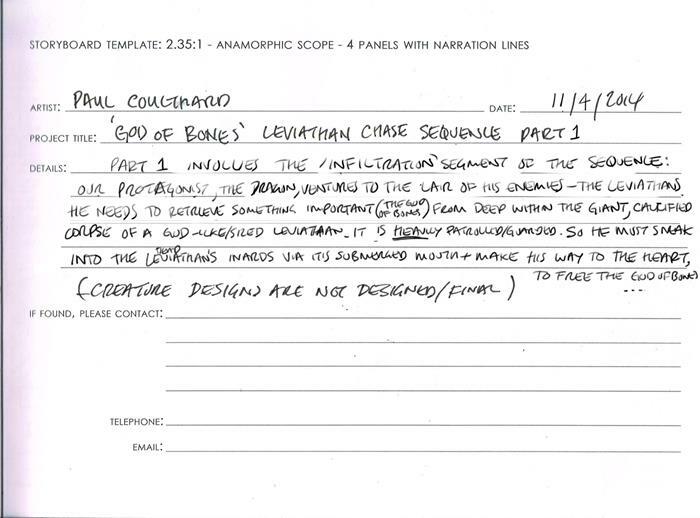 But of course, that wouldn't be much fun, and so ensues a rather elaborate action sequence, beginning with a confined fight scene inside the corpse, then exploding into a full-throttle chase sequence, and culminating in the awakening of the God of Bones himself. 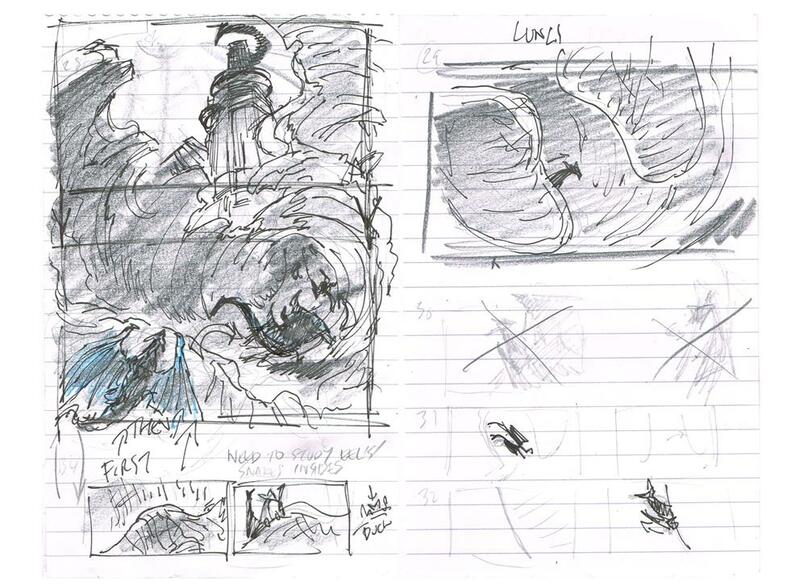 These are my complete first pass rough thumbnails covering Part 1 - Infiltration (sneaking in), Part 2 - Confrontation (the fight inside the corpse),Part 3 - The Chase (high octane aerial action) and Part 4- Awakening (wherein the G.O.B awakens).